This stunning bracelet is part of the Thomas Sabo Love Bridge collection and is made with a string of matt black obsidian beads with a 925 Sterling Silver bar. This eye-catching bracelet has an intricate wave cut design embellished with black cubic zirconia stones for a dazzling effect. 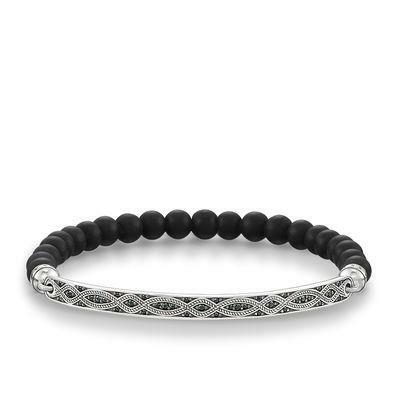 With a cool combination of silver and black, this Thomas Sabo bracelet is great for both ladies and gents and is ideal for stacking with other bracelets.